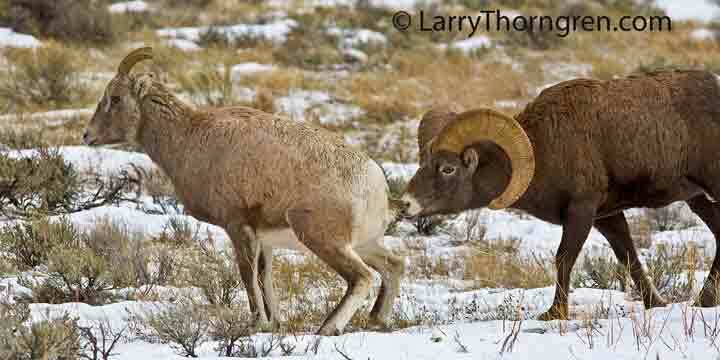 A Bighorn ram sniffs the urine of a female bighorn to see if she is getting ready to mate. Bighorn ewes will often stop to urinate when they are closely pursued by a ram. When the ram stops to investigate the urine, the ewe will often use this time to get away from a ram she does not appear to be interested in. the right to mate. The large, heavy horned rams do most of the mating. This provides an evolutionary push for the rams to develop big horns. When hunters kill the largest Bighorn rams as trophys, they upset this natural process that has been going on for many thousands of years. Heavily hunted populations of Bighorn sheep will produce rams that have smaller and smaller horns as time goes on. Most domestic sheep have been selectively bred by man so that the rams do not have any horns at all. Hunters are doing the same thing to wild sheep.